Waking up every morning with a beautiful sunrise over the green mountains has been a dream come true for me. Every morning, I appreciate the marvelous view from my window on the mountains of Thaba-Tseka (Lesotho). One can observe the fascinating play of the sun and the shadow above the mountains. The weather can change fast and in the next moment there could be rain so that the mountains become dark and mysterious. I came to Thaba-Tseka as a volunteer with “Weltwärts”, a German organization supported by the Federal Ministry for Economic Cooperation and Development Germany (BMZ). “Weltwärts” is a platform with projects on different subjects related to development aid for young people between the age of 18 and 28. The overall aim of the volunteer programme is a cultural exchange. I applied for a volunteer position at a youth center in South Africa. However, my visa was declined which is why I’ve decided to do my volunteer work in Lesotho. 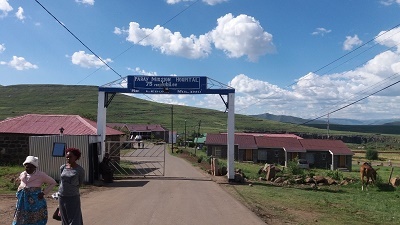 This is the entrance of “Paray Mission Hospital” located in the highlands of Lesotho. In 2013 they celebrated its 75th anniversary. Lesotho is a small land-locked country, completely surrounded by its neighbour South Africa. It has a population of about two million and a GDP per capita of $1034.20. Lesotho is classified as a low-income country. Its territory is mostly highland with its lowest point sitting at 1400m above sea level, making it the highest base altitude in the world (3). I arrived here at the beginning of December 2016 after completing my Public Health studies and will stay for one year to support the Paray Mission Hospital. At the same time, I wanted to develop both personally and professionally as well as get an insight into a completely different socio-cultural environment. Thaka-Tseka is not only a town, but also a district in the middle of Lesotho, the highest kingdom in the world. However, this height makes the country vulnerable to climatic hazards, like droughts or early frost (2). The country faces many challenges, which is why its HDI (Human Development Index) ranking was 161 out of 188 countries in 2015 (1). Agriculture is the major source of livelihood for 80% of the population living in rural areas (2). The health situation in Lesotho is marked by an extremely high HIV prevalence of about 23% in adults, which leads to a reduced life expectancy of 50 years and many orphans (1). This building is the outpatient department which is already the first building for the new hospital. Paray Mission Hospital is a non-profit Roman Catholic health institution, which was officially opened in 1938. It is owned by the Diocese of Maseru under the Leadership of the Archbishop and is managed by the “Sisters of Charity of Ottawa” congregation in Thaba-Tseka. Paray Hospital is geographically situated in the center of the Thaba-Tseka district, which has a catchment population of about 129,056. The hospital owns a school of nursing called “Paray School of Nursing”, that was founded in 1977 and offers three nursing programmes, a nursing assistant certificate, a diploma in general nursing and a diploma in midwifery. Paray Mission Hospital has a total of 158 employees with 79 nurses and six doctors, one manager of hospital nursing services, one department coordinator of nursing services, 35 registered midwifes, one ophthalmic nurse, one theatre nurse, two nurse anaesthetists and 43 nurse assistants. The hospital has also a total of 24 staff members that are supporting services through partner support like SolidarMed, Global Fund, Egpf, US peace corps, Weltwaerts, etc… . The hospital has six in-patient departments (male, female, pediatrics, tuberculosis ward, high care unit, maternity), one operating theatre, one mother-and-child-health department, physiotherapy, dental unit, ART/TB department and out-patient department. The pharmacy is located in the outpatient department. During my time here I will collect and analyze specific hospital indicators (e.g. numbers of admissions, occurrence of specific diseases, numbers of deaths, …) to to evaluate the performance in the different units of the health care facility. I will help to develop a data collection tool (electronical data base) and facilitate the data management, which should lead to a quality improvement of the health care services like patient care and an improvement of the overall efficiency of the hospital. In addition, I will help my supervisor with different daily tasks like compiling data for quarterly reports or preparing for meetings. Each patient has to register, is screened for Tuberculosis and vital signs have to be measured before the medical examination. As already mentioned, the hospital opened in 1938. Therefore, the building is no longer suitable to meet modern standards: wards are too small, bathrooms need to be renovated and staff housing is not appropriate. Therefore, the Sisters of Charity plan to build a new hospital and are currently seeking donations to realize this project. 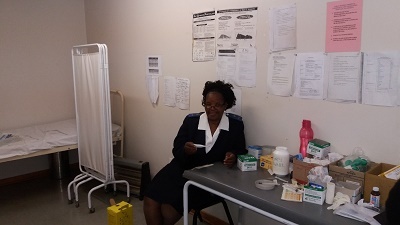 In addition, the hospital has problems with drug supply and procurement as the Government of Lesotho cuts the budgets presented by the health facilities from time to time. 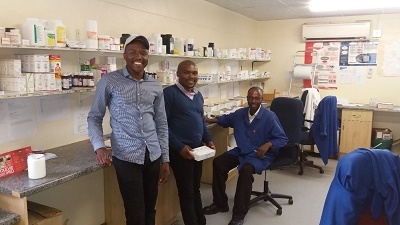 There are no specialists and special devices to address all the health care needs, which is why complicated cases are referred to the capital of Lesotho, Maseru, which is about four hours away by car. Moreover, there is only one old ambulance that can accommodate one patient at a time. Even though the staff has to deal with many challenges at the hospital, they are always motivated and patient care is their passion. I felt comfortable from the very first day and the team welcomed me very warmly with a typical African welcome dinner. The staff housing is just next to the campus so it is easy to organize after work activities. To me it feels like I am surrounded by family. I enjoy spending time with my colleagues, who inspire me every day. The day in Thaba-Tseka usually ends as beautifully as it has started – with a magnificent sunset that turns the mountains red and Thaba-Tseka falls asleep very peacefully. Paray Mission Hospital faces many challenges. If you consider supporting us with manpower or funds, we would be very happy if you contact us. Please find contact details below. The World Bank helps the government enhance competitiveness, foster private sector–led growth, impro ve service delivery, and diversify its economic base. 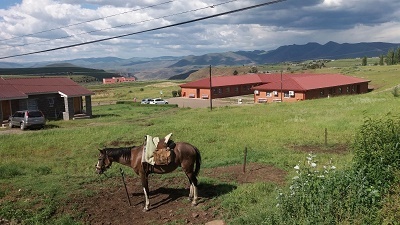 The Kingdom of Lesotho is made up mostly of highlands where many of the villages can be reached only on horseback, by foot or light aircraft. Find more information on the topic working abroad here. Published in GI-Mail 05/2017 (English + German edition). Sign up for GI-Mail here.